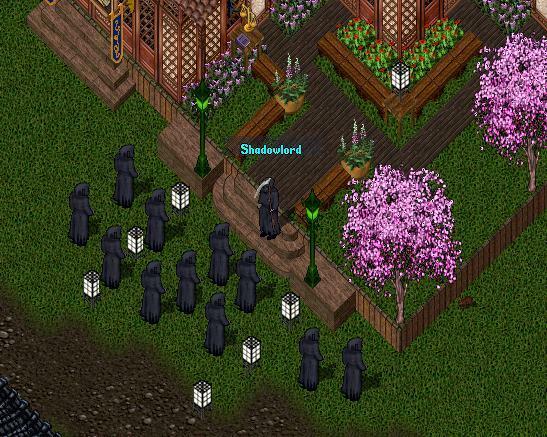 A Shadowlord has called fourth his forces awaiting the decision to come to PaxOku. The language they speak is hard to understand but, the words seemed harsh and cold. Vampires and Necromancers have also been seen in the area around the city. It would seem from what I can see from under the steps of the Mayor Office in PaxOku, that this seems to be a large group gathering. Stealthing seems to be one thing these groups do well. When all is quiet they appear. During a very loud and epic speech the only words I could make out were: Paladin Corruption, Souls, wells and also a new home. I do have so many questions. WHy the gathering? What will happen if the law is over turned or if it is kept? Is this a fighting force to oppose the statehood laws? Or have they just found a new home? The following was stated at the July 10, 2007 PaxLair Weekly Meeting held at the Lakeshire Dock House in Ilsnenar. First is a summary of statements made (with some lines re-ordered since multiple conversations take place), then the entire transcript of this segment of the meeting is contained in another article. This transcript shows Sheriff CaT stating the PaxOku Decree to ban paladins from PaxOku. The entire transcript also shows Mayor Gareth's questionable state of mind at the meeting. CaT: Excuse me, I have an announcement. Gareth: Yes, yes, it must stop to dark in the well. Cross MacLeod: I dont go there anyway. CaT: Mayor Gareth, is this not true? Gareth: Yes it must be! Winfield: Very well. I will not complain. It is a city run by the Mayor. Winfield: Just don't unbalance the statehood, then I care a great deal. Gareth: Yes! balance...dark in...the rock of well. The highly controversial PaxLair Statehood Hearing of Law has gathered the attention of many people throughout the Realm. Not only are citizens of the Statehood attending, but the Hearing has the special interest of the Council of Mages, Council of Sin, and Verity Syndicate. This is a hearing of a PaxOku Decree being questioned as to its lawfulness under PaxLair Statehood Law. This is not a trial of guilt or criminal act. Mayor Gareth of PaxOku issued a decree through his Sheriff CaT on July 10, 2007, to ban all paladins from PaxOku. Mayor Nanoc of Dragons Watch brought the PaxOku Decree into lawful question to Governor Winfield on the basis that is allegedly violates the PaxLair Statehood Neutrality Law. Governor Winfield held two one-hour hearings thus far on July 23 and August 1 with an expected final third hearing to be held on August 6 starting at 9 PM ET with assembly at 8:30 PM ET. The hearings are held at the Mage Tower in PaxLair City, the capital building of the PaxLair Statehood. I, Gareth Lightenburg, Mayor of PaxOku, on July 10, 2007, do hereby Decree that For the security of the city of PaxOku and its citizens, all Paladins are to be removed and kept out of PaxOku City until such time as the government of PaxOku can identify the threat to the water supply and secure it in PaxOku city. PaxLair is a Community of Neutrality. People or groups coming to PaxLair in the spirit of Neutrality will not be attacked, stolen from or banned unless they violate PaxLair's laws, are considered untrustworthy, or have been declared criminals of the Community. Governor Winfield allowed free testimony to be given at the first two hearings, starting each time with Mayors Gareth and Nanoc, and then from the audience. Governor Winfield stated the next hearing "must focus on the issues leading to the Decree. Not things after the decree." Winfield said he is most interested in hearing testimony about what led up to the PaxOku Decree, most specifically the "succinct reasoning and evidence leading to such an abruptly mandated Decree against Paladins. If all the testimony is a vision from a Seer, and a Luna Lance, then I can deal with that. I can attempt a ruling based on that reasoning. If there is potential the Book of Wrong had influence here, I would like to know that before I make a ruling." It is expected the Governor will do most of the questioning in the final hearing on August 6. (Statehood) NEUTRALITY LAW: PaxLair is a Community of Neutrality. People or groups coming to PaxLair in the spirit of Neutrality will not be attacked, stolen from or banned unless they violate PaxLair's laws, are considered untrustworthy, or have been declared criminals of the Community. (PaxOku) PAXOKU DECREE BANNING PALADINS: I, Gareth Lightenburg, Mayor of PaxOku, on July 10, 2007, do hereby Decree that For the security of the city of PaxOku and its citizens, all Paladins are to be removed and kept out of PaxOku City until such time as the government of PaxOku can identify the threat to the water supply and secure it in PaxOku city. The following is a long, but important summary and testimony regarding a Hearing of Law in the PaxLair Statehood. So far, two days of hearings have been held -- July 25 and August 1, 2007. A third and final hearing is scheduled for Monday, August 6, 2007. RACES OF BEINGS, CITIES, GUILDS, ESTABLISHMENTS and EVENTS !! See the UOForums Chesapeake Calendar for more information about this event. Nine paladins were killed in PaxOku yesterday. It is not clear who killed them, but the reason is clear. PaxOku Sheriff CaT announced at the July 10th PaxLair Statehood meeting that Mayor Gareth of PaxOku issued a Mayoral decree banning paladins from PaxOku. The Mayor re-affirmed the decree yesterday after these killings. He said paladins broke the "No Paladin Law" in PaxOku and were killed by the his orders. After the paladin deaths, Mayor NANOC and Deputy Mayor Phoenix from Dragons Watch replaced paladin guards and collected the fallen in PaxOku. The recovery and re-enforcement effort went without skirmish. Paladin Cross McLeod of PaxLair City was outraged at the decree. He sarcastically stated at the July 10th meeting, "Sure, a NO paladins policy is OK, but not a NO orcs policy" referring to orcs running PaxLair City. The incident has called into question the legalities of Mayor Gareth's decree and the actions of paladins in PaxOku. The Tuesday, July 10, 2007 PaxLair meeting will be held at the Dock House in the city of Lakeshire/Mireg (43-25N 7-10W) in Ilshenar. The easiest way to get to the meeting location is to utilize the Sacrifice-Ilshenar Moongate, then head Northward into the city of Lakeshire/Mireg. Everyone is invited to attend the meeting, make introductions, hear the latest about PaxLair and other cities and events, announce shard-wide items of interest, introduce your guild, and get to know people around the Realm. For this meeting, a rune cannot be provided due to the nature of the location. Participants with negative karma may be attacked by good natured monsters along the way, be careful! Please also bring your own seat and tools. The Tuesday, July 3, 2007 PaxLair meeting will be held at the Haunted Ruins (10-22N 38-31W) in the Lost Lands of Trammel. A rune is at the Tea House in the book on the steps in PaxOku, Tokuno. See the entire Calendar entry with images and maps here.